Geoff Mearns, dean of Cleveland State University's Cleveland-Marshall College of Law has been named interim provost of the University. The sitting provost, Mary Jane Saunders stepped down - apparently immediately. 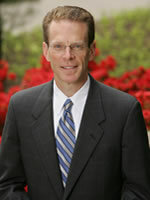 Although I don't have any information right now, I assume that somebody else will be holding down the fort at the law school...or else Dean Mearns (a UVa law grad and former clerk to Judge Boyce Martin on the Sixth Circuit) won't be spending much time in Shaker Heights with his wife and five children. (That info is on his law school bio page - promise!) Congrats to Provost Mearns!